So, you wrote an exceptional piece of article or story, patted your back and proceeded to secure it with a super secure password using the Protect Document feature on Microsoft word, patted your back once again and closed the document. You come back and try to open the Word document, it asks for a password, you enter it, and it turns out to be the wrong one. Creative writers tend to protect their work in different ways. In this age of the internet, once your writing is on the internet, you can’t take it back. Microsoft Word has a Document Protect feature that allows you to protect your document by encrypting it with a password or restricting access with read-only and digital signature options. However, it happens that, by trying to make the password extra secure or if you don’t use the password protected document too often, you forget the password. Microsoft Word doesn’t have any built-in feature that can help you to recover the password. Fortunately, there are third-party programs that can remove the password from a protected Word document. In this article, we take a look at the best software to recover Microsoft Word password in no time. This list consists of both free and paid/premium password recovery program, so go through all the recommendations before taking your pick. What software can I use to recover Microsoft Word passwords? Passware is a leading password recovery and data recovery software developer and offers Windows Key Basic as a software solution to recover or remove MS Word document password on window devices. The company boasts of some elite companies as its customers which includes NASA as well. Passware Kit Basic is a multi-purpose tool that can help you to recover password for over 50+ file types including MS Excel, MS Word, Windows administrators, emails accounts and websites. 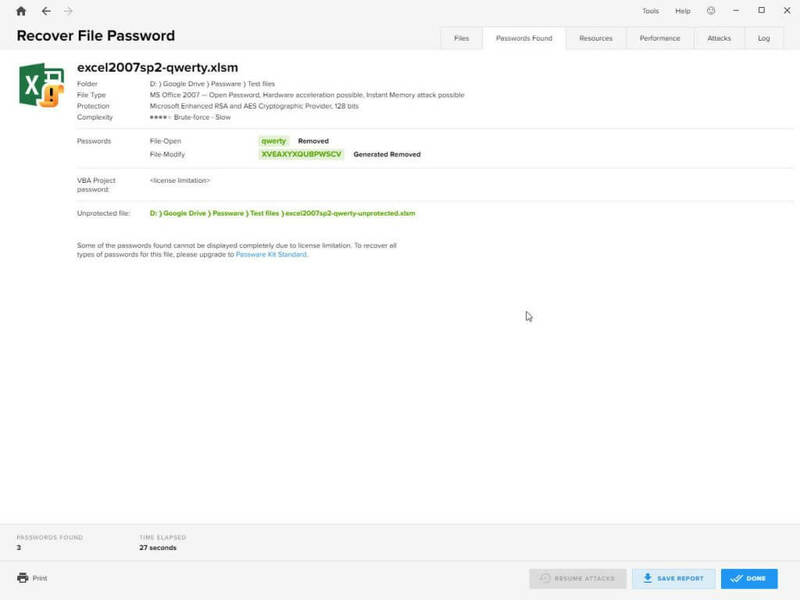 Passware uses different types of attack modes to recover the forgotten password for your word document. You can begin with the most common Dictionary attack and then proceed to Xieve, Brute-force and Known and Previous Password and their combinations. To recover Windows administrator password, Password Kit Basic needs to be installed on a bootable flash drive or CD using the ISO. You can read more about creating bootable flash drive and multiboot flash drive here. Once the password is recovered, the software will save them in a separate file to be used again to open locked documents. Note that Passware Key Kit has several editions, but to recover Word document password, the basic edition should be enough. It is a premium tool, but you can grab the free demo to test it out. The user interface is simple and easy to use. Once installed, launch the Passware Kit Basic and click on Recover File Password option. Now you need to select the Word document that is password locked. The tool shows some information related to the file like the file type, encryption and possible attack mode that will be effective in recovering the password. There are three modes to recover the password that includes Run Wizard, User Predefined Settings and Advanced Customized Settings. Begin with User Predefined settings recovery mode option. The tool will start the recovery process and will show the result in a few minutes depending on the complexity of the password. You can copy the recovered password by clicking on Copy link in the result window. Passware Windows Kit Basic is an effective solution and can recover from administrator to encrypted file passwords with some user help. However, it costs $49 for a single user license. 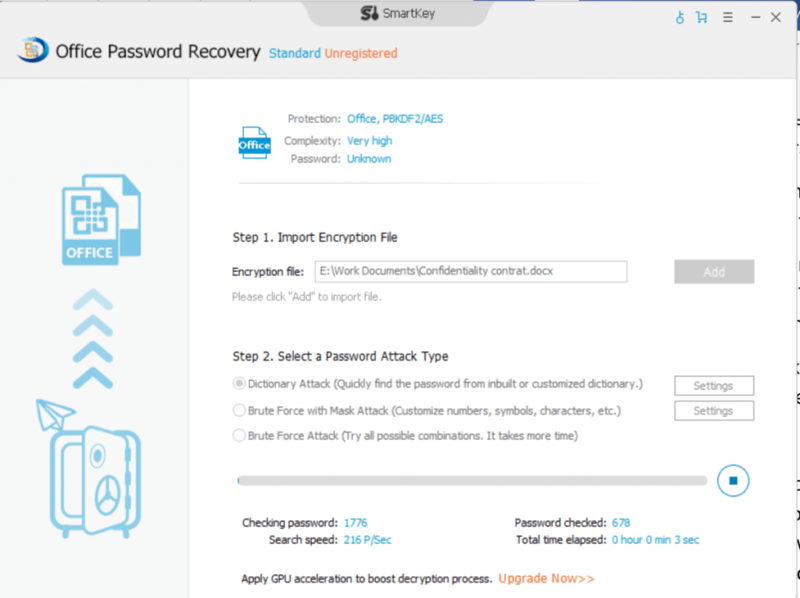 Office Password Recovery from Smartkey is an all-in-one password recovery solution to help you recover forgotten password for MS Word documents. It is a premium software with a free demo on offer. Using the tool, you can gain instant access to password-protected documents in MS Office including Word, Excel, PPT, Outlook, Access and more. It makes use of hardware resources to speed up the recovery process and also uses the GPU acceleration if required. From MS office 97 to MS Office 2019, SmartKey’s password recovery solution is compatible with almost all the versions of the Microsoft Office suite. To crack the password, it uses three attack modes that include Dictionary Attack, Brute-force with Mask attack and Brute-force attack. The second option utilises the user-defined characters, symbols and numbers to crack the password. The major difference between the Standard and Professional edition is the compatibility for GPU acceleration and access to Online password remover feature. The intuitive UI makes it easy to recover password for all the users irrespective of their understanding of the computer. To retrieve the password, launch the password recovery program, click on the Add button and select the password encrypted Word document. Next, select the Password Attack Type. There are three modes, start with Dictionary Attack. Click on Start to begin the process. In a few minutes, it will crack and show the password. If you are using the demo version, the software will hide recovered passwords with asterisks. That’s it. You can copy the password and use it to decrypt the Word document. The Office Password Rescuer from IseePassword is another option you can consider. It is an MS Office password recovery program and works with all the application in MS office. However, as of now, it is only compatible with MS office 2.0 to 2015. So, if you are on a newer version of Office, you probably have a hard time cracking the password with this tool. The password cracking method is identical to other recovery programs as it comes with 3 Attack modes Brute-force, dictionary, Mask and Smart attack. The user interface is not the most modern we have seen. However, it is simple and gets the job done. To decrypt the Word document, launch the program. Click on the Open button and select the encrypted Word document. You can customise the attack with multiple options like changing length, range, dictionary etc. Click on the Start button to proceed. The process may take some time depending on the complexity of the password. The recovery password is displayed on the result page. 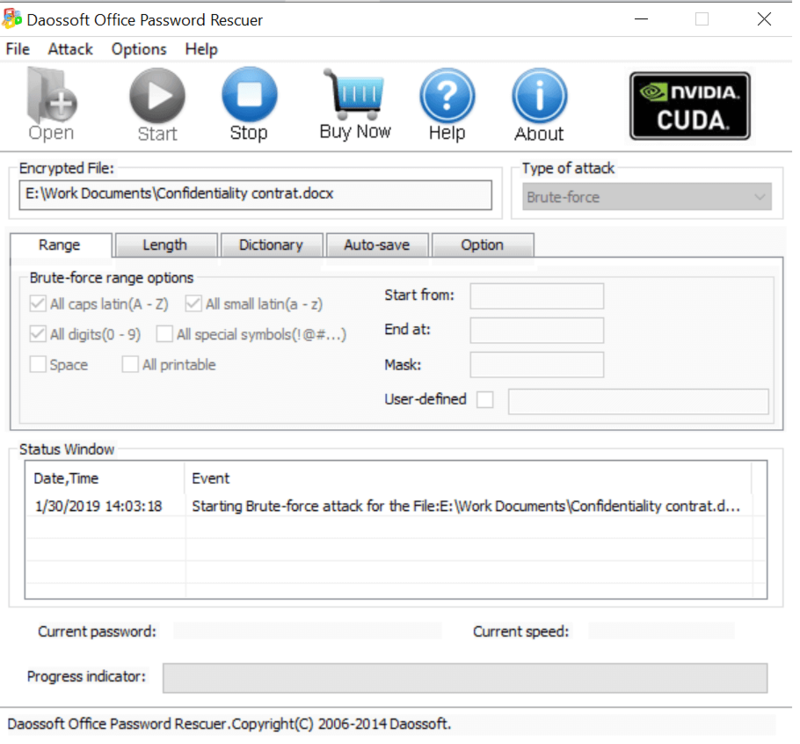 Office Password Rescuer is a premium program and works with office documents encrypted using Office 2015 and earlier. With newer encryption methods, it had a hard time recovering the password. 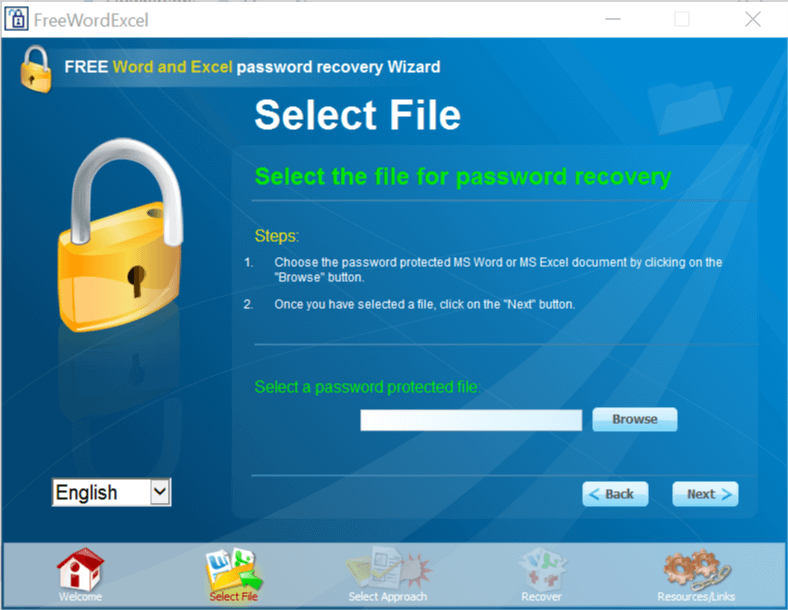 If you would rather try a free password recovery alternative to recover password protected word document take a look at Free Password Recovery Wizard. It is a free utility that uses Dictionary and Brute-force attack modes to unlock files. The program only supports the MS Word / Excel 97-2003 file format. Which means you won’t be able to recover files encrypted using a newer version of Office program. You can download and install the tool from the official website. To recover any compatible Word file, launch the program, click on the Browse button, select the file and select the attack mode (approach). Click on Recover tab to begin the recovery process. This free Word document unlocking program can crack the weak passwords with ease. However, to crack a password with new encryption methods, you probably need to use the premium tools to increase the chances. 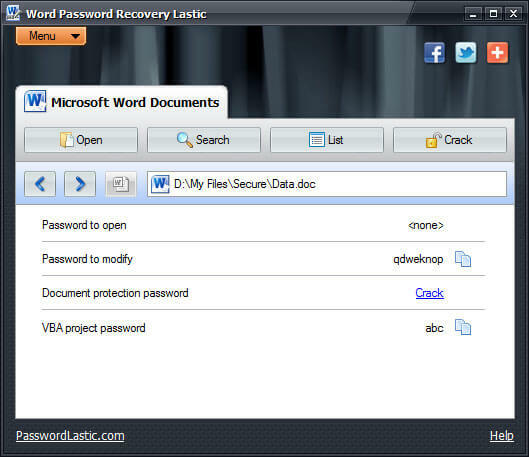 Another interesting program to recover MS Word document password is Word Password Recovery Lastic. It works with Word 97 to 2013 formats. The tool can automatically find all the encrypted documents in your local hard drive and also enables you to copy the recovered password to the clipboard. It has a very basic user interface. 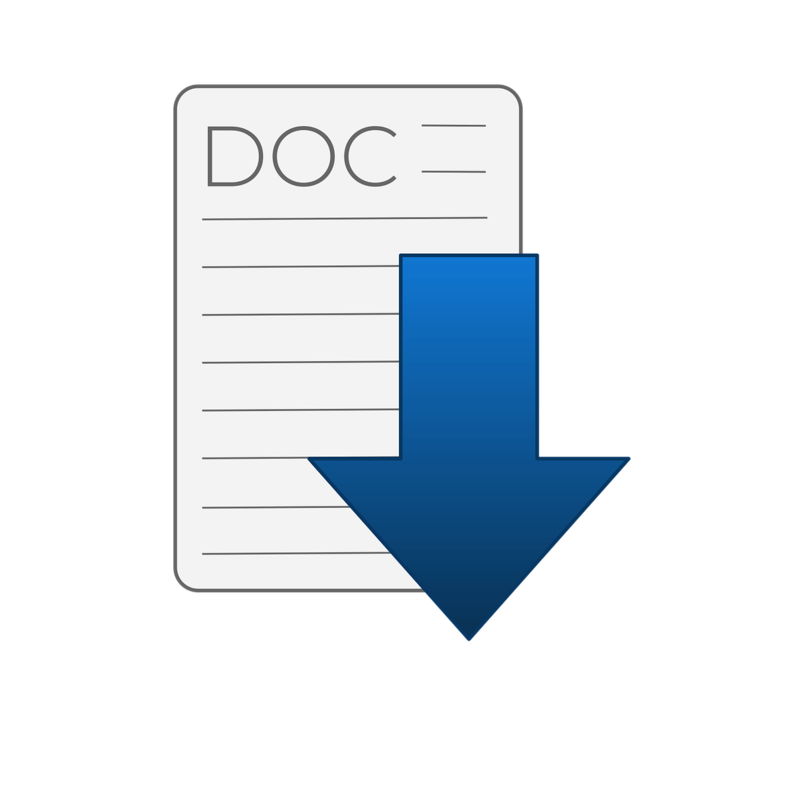 Click the Open button to load the Word document, or you can let the program search for it automatically. Next, click on the Crack button to begin the recovery process. The process does take some time and if found the password is displayed on the screen. Word Password Recovery Lastic is a paid program and does not offer too many features to crack the password. Try the trial version to test the software before making a buying decision. Unlocking files that are encrypted with the latest AES-128 key is a tough nut to crack especially for free password recovery programs. However, the premium tools are usually compatible with the latest version of Microsoft Word hence you have better chances of recovering or removing the password. The older version of Microsoft Office has weaker encryption; as a result, the chances of free password recovery software being able to recover the password-locked Word document is better. In any case, use the trial version of recommended software to see the effectiveness. Since the free version allows you to use and recover the password by hiding it with asterisks, you can upgrade to the premium plan to unhide the recovered password. Although it is important for some users to protect their documents due to its confidentiality or plagiarism issues, it is advised to use a password manager to store all of your account passwords at a single place. This way you don’t have to use one password for all the programs nor required to remember multiple passwords at the same time.